BISHOP Christopher today announced the appointment of a new archdeacon to serve the parishes and communities of Portsmouth and Havant. Canon Joanne Grenfell, who currently works in Sheffield Cathedral, will become the new Archdeacon of Portsdown after Easter. She’ll take over from the Ven Trevor Reader, who is retiring from the role in January. She will become one of three archdeacons serving our diocese, and the third appointed by Bishop Christopher since he became our bishop two years ago. The post involves supporting Church of England clergy in 44 parishes in Portsmouth and Havant, offering Christian leadership on behalf of the bishop, and helping the bishop to plan strategically and implement God’s vision for the diocese. Dr Grenfell is currently a residentiary canon in Sheffield Cathedral, and both director of ordinands and dean of women’s ministry in the Sheffield diocese. Her husband, the Rev Dr James Grenfell is also ordained, and they have three young children. He is priest-in-charge of St John the Evangelist, Ranmoor, in Sheffield, and area dean of Hallam. Bishop Christopher said: “I’m delighted to announce that Canon Joanne Grenfell is the new Archdeacon of Portsdown. She will bring much experience to the communities in and around Portsmouth and Havant. Serving in parishes and the cathedral in Sheffield, she combines pastoral gifts with work in leading those who are helping to draw out discipleship and as part of the bishop’s and the cathedral teams. After training at Westcott House, Joanne was ordained in Liverpool in 2000 and served her curacy in the Kirkby Team Ministry, a series of urban priority housing estates on the outskirts of the city. During this time, she was also part-time chaplain at Aintree University Hospitals. 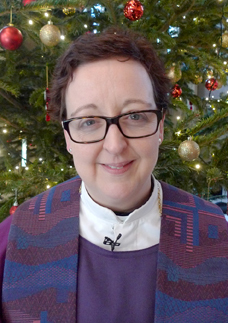 Joanne became joint priest-in-charge of Sheffield Manor in 2003, with responsibility for the Ripon College Cuddesdon Urban Theology programme, and for William Temple Church. In 2006, Joanne was appointed diocesan director of ordinands and residentiary canon at Sheffield Cathedral, and then, in 2008, dean of women’s ministry, in addition to these roles. Before ordination, Joanne was lecturer in English at Oriel College, Oxford, specialising in Renaissance literature. She was also a Reader at the University Church, Oxford. Joanne has published in the fields of sixteenth-century literature and cultural geography, literature and theology, women’s pastoral theology, and urban ministry. She is an occasional Church Times columnist, and writes a sermon blog. She has served as a cathedral representative on the panel responsible for appointing deans, and is a member of the council of the Archbishop’s Examination in Theology. Her predecessor, the Ven Trevor Reader, announced in the summer that he would retire in the New Year after serving as Archdeacon of Portsdown since 2006. His final service as archdeacon will be on Christmas Day.